I can’t explain my love towards summer. I believe we should all take advantage of this beautiful season and cook and eat as many as possible vegetables and fruits, which are given to us in plenty. Tomatoes are one of those vegetables that we could only enjoy during the summer, this is the season, they are absolutely delicious and amazing and most of all you could easily find a a local farm to stock up with fresh vegetables. 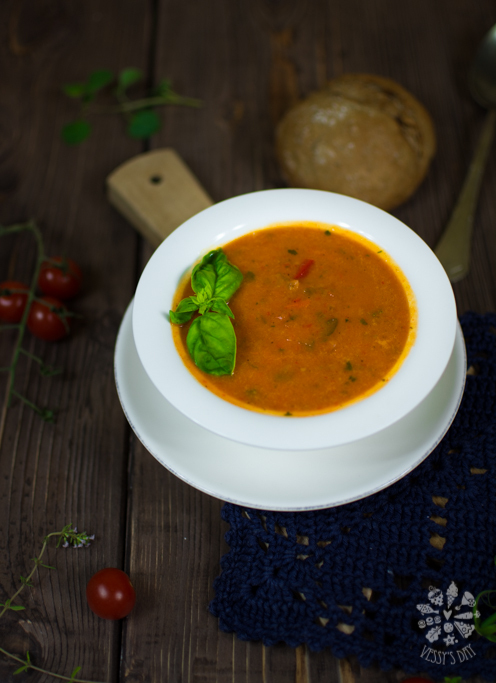 I would recommend you to try out this fantastic tomato soup for the first time only when you have good, delicious, ripe tomatoes on your hand, otherwise, just don’t even begin with it…. Basically the taste of your soup depends more or less on the taste of your tomatoes. That is why it is important to try a piece of every ingredient before you add it to the meal… just to make sure your soup will taste perfectly. The greatest thing about this soup is that you could have it both cold or hot – depending on your mood! If you have a meat addicted husband like mine, you could easily satisfy those needs, as well, by adding a very well grilled bacon, chopped into small pieces. This soup will be ready in 30 minutes, which makes it a great middle week meal, too! Start by peeling and chopping up the tomatoes. The easiest way to peel tomatoes is to add them to a boiling water for 30 seconds – they skin will crack and fall off so easy. Then, chop them up and set aside. Heat the olive oil in a large saucepan, on medium. Add and cook the onions until they become translucent. Add the peppers and garlic. Cook for a few minutes. Add the fresh tomatoes and cook until they begin to simmer. Here is the momеnt to add the sugar – this depends on the taste of your tomatoes, if they are sweet then you could skip the sugar step, but if your tomatoes are a bit sour, then it is recommended to add a little bit of sugar to stabilize the taste. Then, add the canned juice of tomatoes and stir well. Cook the whole mixture for about 10-15 minutes, or at least the water begins to evaporate and the soup begins to thickens. Turn off the heat and add the green herbs – basil and parsley. 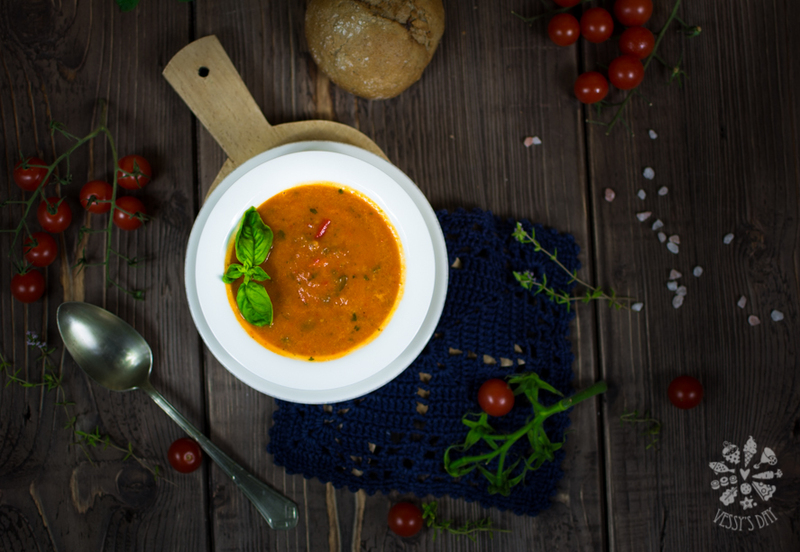 With a hand blender, blend all ingredients to texture of your choice – you could blend the soup to a fine pure or leave a few pieces of tomatoes. Serve cold or warm, with a table spoon of sour cream or without.